During the course of Kate’s illness, I’ve always tried to anticipate the future and make necessary preparations. With her changes over the past few months, I’ve been doing a few things that I have held off for some time. The biggest one involves the yard. A year or two after Kate began her “extreme pruning” activity, I began to wonder about the long term impact it would have on the shrubbery. At first, I thought it might be beneficial, but it would come at a time when she could no longer appreciate it. It wasn’t long after that when I suspected the shrubs might be permanently damaged. At the time, she had three things that occupied her time – pruning (“pulling leaves”), editing photos for a photo book on her computer, and working jigsaw puzzles on her iPad. Pulling leaves was her major activity when weather permitted. She could spend as long as 6-8 hours a day in the yard. Because she seemed to enjoy it so much, I made a conscious decision to let her pull leaves as much as she wanted even if it meant having to replace the shrubbery. When this past spring arrived, it became clear that most, if not all, of the shrubs would have to be replaced. I didn’t want to move too quickly. I thought it might bother Kate. I didn’t want her to feel guilty. I realized she might never make the connection between her pruning and the demise of her shrubs. On the other hand, I didn’t want to risk it. Two or three months ago, I hired someone to start the project. I wanted it to be gradual so that Kate wouldn’t notice. He began by cleaning out the weeds. That’s been a big job. He is still working on that. He has another fulltime job, so he only works on Saturday. Along the way he has taken out four or five good sized shrubs. There are probably another twenty that will have to go. I think we should have the clean up done in the fall. Then we will look at planting new shrubs. For a long time, I have felt the need to do some serious work to the inside and outside of the house itself. I recently had all of the windows replaced. The next job is painting the outside. I’m going to wait until fall for that. Our housekeeper passed away in April. Her daughter filled in for her until the end of July. Through a friend I found someone else. She started yesterday with a deep cleaning of the entire inside of the house. She brought a helper, and the two of them worked twelve hours. Like most people, we’ve accumulated a lot of “stuff” that we never use. I’ve spoken with her about helping me clean out a lot of these things. Chief among those are clothes that Kate will never wear again. Most of these are too small for her now. I’m going to feel better when we get organized again. These changes are a direct result of the changes in Kate’s condition. I wanted to allow her to continue to be the one in charge of the house. That has been her role in the past. Of course, I recognize that I have gradually come to be the one to assume that role, but I haven’t wanted to do anything that I thought she might not like. At this point, I don’t think she will even notice much of what is done. A couple of years ago, I took out the tall entertainment center and the 42-inch TV in our bedroom and replaced it with a much lower cabinet with a 65-inch TV on top. I don’t think she ever realized the change. She never commented on it. By now, of course, she would not remember at all. We are now approaching the middle of the summer, and we have not made a trip to Lowe’s for plants. Last year and the year before we were making such trips almost twice weekly. The last time Kate expressed an interest was during the winter. We went there but found they didn’t have much and said they would start getting things in late February. On several occasions, I have asked Kate if she would like to go. She has said with a groan, “Not now.” I have even suggested that she might want to put some plants in the pots beside the spa as well as some others for the patio and front porch. She has unenthusiastically agreed that it would be nice but has never picked up it so as to take action. I take this as a critical sign in the progression of her illness. It is equivalent to her giving up her computer (email, Facebook, and finally, her photobooks). Fortunately, she is still pulling leaves although our recent weather has meant that she comes in after being outside for a short time. It also means for showers and changes of clothes. I have also made a change. I am no longer suggesting that she wear work clothes outside. I just let her wear whatever she has on when she decides to pull leaves. I have mentioned several strange behaviors of Kate’s, but I don’t think I have mentioned that she has been taking paper napkins from the restaurants we frequent. At first, she was doing this to have them in the car when she might need something for her salivation problem. Now, however, she is tearing them up (along with the paper towels she has used in the house) and put them in a basket in the garage. It is similar to her collecting hickory nuts and putting them in the basket on our island. The big difference is that she is using the nuts as a decorative effect. I didn’t realize what she was doing at first. I thought she was tearing up napkins to put in her compost. When checked the compost, I didn’t find any. I do find an occasional Dr. Pepper can and yogurt containers as well as the tops of the containers. I haven’t asked her to explain why she is doing this. She wouldn’t remember. On at least two occasions, I have been walking out the door of the kitchen on the way to the car when she starts to take a yogurt container to the compost. In those instances, I have pointed out that they go in recycling and not the compost. The combination of the increasing problems she is having with her puzzles on the iPad and the heat is that she seems to be more restless (behaviorally speaking). What I mean is that she spends a little time at Panera until her frustration pushes her to go home. Then she works outside for a little while until she gets hot. That is exactly what has happened this morning. We were at Panera for a little less than an hour between 9:00 and 10:00. We went home where she pulled leaves. She came in and took a shower. She came into the family room where I was writing this post for my journal and said, “Are you coming?” She was ready to go back to Panera. That is where we are right now. It is 11:19 a.m. I think we will just work a while on our devices until around noon when we will have lunch. Then I imagine we will go back home. I feel sure she will pull leaves a while until we are back here since we don’t have any other plans until 5:00 when we have a visitation for a former neighbor. In the car on the way over here, she pointed to her cup that was sitting in the cupholder and motioned to me as a way of asking if it were all right for her to take a drink. When we parked at Panera, she did the same thing only this time she was asking if she should take her cup into Panera, something we do every time we come here. I am so glad we were all able to be together for Brian’s graduation. I appreciate the efforts of each of you to make this a special occasion. A year ago, I would not have expected that Mom and I would have been able to make it. I am grateful that I was wrong. That said, I am sure that both of you could see that life is different for her now. The change is even more dramatic than at the time Kevin and Taylor were here in March. 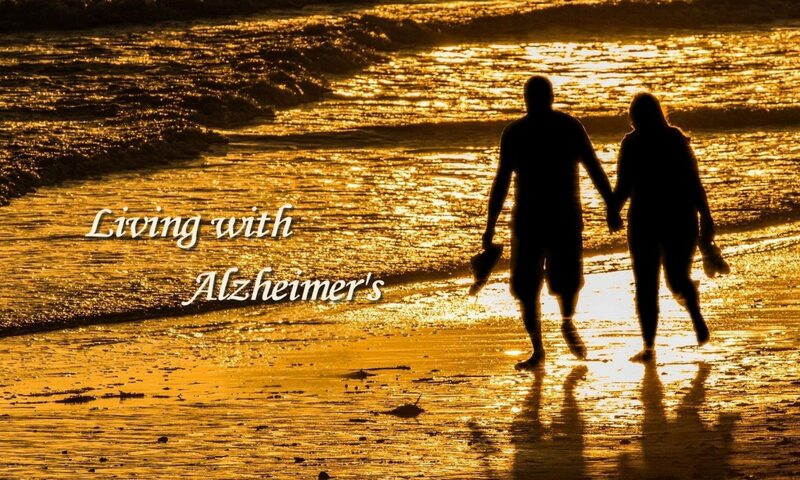 We are now entering the first chapter of what is the portion of this journey that most of us think of when we hear the word Alzheimer’s. Up until now, we have been able to lead what appears to outsiders as a normal lifestyle. (It has been far from normal for us.) We have been very active and have enjoyed ourselves. Mom is now deriving less and less pleasure from things that in the past have provided her a great deal of pleasure and satisfaction. As you know, this doesn’t get better. Our travel over the past ten days has been hard on her. It has led to her being very tired and confused. I have heard others talk about the challenges of travel, but up until now, those issues have been mostly the burden on me. The burden is now shifting to her without any relief on me. Kevin, I really hated to leave the swim meet the other night, but I was really feeling for Mom. She is very sensitive to the heat. More importantly, she does not know what is going on around her. Not that it would have made any difference but, she wasn’t able to see any of the races themselves. I felt bad that I hadn’t brought her iPad to the meet. She would have been able to entertain herself in that way. Neither did I have it for her at the graduation. Speaking of which, as we left the graduation the other day, Mom said, “Tell me again why we were here for this thing.” She hadn’t realized at all that she had been to Brian’s graduation. I am equally sure that she didn’t even know that it was a graduation. While we were there, she never completely realized that she was in Lubbock. As we approached our landing on Saturday, I said we’re coming in 25 minutes early. She asked me where we were coming into. When we landed in Knoxville last night, I said, “Well we’re here.” She said, “Where?” I told her Knoxville. She said, “Where we just left?” I told her that was Atlanta. On the way home, we went to Chalupas for dinner. After we got home, she worked outside for about 30 minutes. This morning that was the first thing she wanted to do. Usually we go to Panera first. She was outside about an hour after which she came in and showered. Then we went to Panera and to lunch. Since our return from lunch, she has been outside. This is one thing that she will be able to continue doing for a while longer. I am thankful for that. She is having more trouble with the iPad. She keeps hitting buttons that take her out of her puzzle, mostly for offers to buy other puzzles. Then she doesn’t know what to do to get back. Though I encourage her to ask me to help her get back to her puzzles, she thinks she is bothering me. When she can no longer use her iPad, she will have lost half of what entertains her now. I hate for that day to come. Looking ahead, I am still planning to make our trip to Chautauqua in July. That is four weeks from tomorrow. While I don’t think this year’s stay will be like those in the past, I think she will feel comfortable being on the grounds. I think I told you that we bought a bench for the amphitheater that is being reconstructed for this year’s session. Unfortunately, it looks like the benches won’t be ready. That was one of my primary motivations for going this year so that Mom could see where our bench is located. Of course, I need to keep in mind that at this point, things like this don’t mean anything to her. It’s really for me. The next planned trip is to attend the TCU homecoming in October. I am not at all sure that will happen. It all depends on how Mom is doing. At this point, I don’t think we will make it. If that trip is not possible, that means that the trip to Lubbock for Christmas will be out as well. As I close, I want to reiterate what you have heard me say so often before, Mom and I have been very fortunate that her decline has been so slow and without any special complications. I continue to treasure not only the memories of our whole marriage but also those since her diagnosis January 21, 2011. One of the few things she said about our trip was how proud she was of both of you and your families. To me, that alone was worth the trip. I know that even now she doesn’t remember the details of the trip or, possibly, that we even took the trip, but the feeling she has for the two of you remains. That’s another thing for which I am grateful. Kate and I returned from Asheville in time for lunch. When we got home, she immediately asked if she could pull leaves and use the clippers. She didn’t even come inside. She was out as long as she often is. I would say about an hour and a half. She came in and took a shower. She then announced that she was ready to go. I asked her where she would like to go. She didn’t know. I asked if she would like to stay at home a while and work on her iPad. She said yes and went to the bedroom where she stayed about 30 minutes. While she was in the bedroom, I took my laptop to her and played a video of pictures from our 54 years. I had posted it on Facebook. She loved seeing the pictures. She indicated she was tired and asked if she could rest. I told her she could. Then she promptly came into the family room with her iPad. Before working on it, she lay down a few minutes and then went back to the bedroom. Then she asked if she could go to the front yard. I told her that would be fine. She has been out there about 45 minutes. She is happy. I was somewhat uneasy at night. I am aware that she got up during the night when I did not hear her. To the best of my knowledge, she did not try to leave the room except the first night. The security latch prevented her from leaving. I heard her and got up and brought her back to bed. Each morning when she got up, she looked quite confused. I suspect I may see more of that this weekend when we are in Lubbock. I continue to believe Kate is going through a transition to a much deeper stage in her illness. Time, of course, will tell. I am still planning on our going to Chautauqua in July. That is only 5 weeks away. I imagine things will be quite different there. I fear that she won’t be as interested in attending the lectures session as she usually is. In fact, last year she didn’t attend most of the afternoon lectures. I went alone. I am not sure about doing that this year. I am getting much less comfortable about leaving her alone.